It is impossible to quote a 'classic' line-up for Them. They probably had the least stable personnel of all the famous R&B units of the era. Only Van Morrison and Alan Henderson can claim to have stayed the band's brief course from obscurity in Belfast through to world fame. The members shown above were those at the time of their UK chart success. Identifying Them's musicians is hardly helped by the fact that their singles' recordings made extensive use of session men. Frequently, the likes of Jimmy Page was brought in to add a little more brilliance than their producers thought the group capable of on their own. No doubt this added to the general discontent and jealousy that plagued the group for most its life. 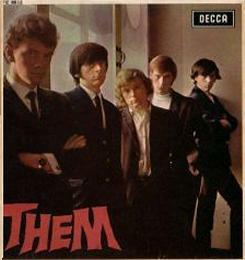 The group had originally been formed by Harrison and Henderson in Belfast during 1964, spurred on by the soaring popularity of British R&B through groups like the Rolling Stones. They soon enjoyed enormous patronage on their home ground, but their transition to the UK mainland as a touring group started as a real struggle for survival. Their first single suffered from lack of promotion, selling well in Northern Ireland where they were well known, but doing nothing elsewhere. It was their second single release 'Baby, Please Don't Go' that gained them international attention and they were able to consolidate this with the Bert Berns produced 'Here Comes The Night'- a song already covered in a different style by Lulu. However, it is possibly Morrison's wonderful 'Gloria', the 'B'-side of their first hit, with Page's masterful guitar work that had the greatest long term influence. Shown on the right is the only UK release on the EP format that Them had issued during their short lifetime. The EP is much sought after and very scarce, despite the fact that it sold well at the time it was issued. Some of the tracks on it are not available on their singles, so fans who want those extra songs will want to seek this record out, making it a real collector's item. Sadly, the internecene wrangling within the group, and the unhappiness felt by Van Morrison in particular, led to Them breaking up in 1966. Although Henderson tried to reform the group for the umpteenth time during 1967 ; on this occasion without Van, the attempt proved futile.